One of the many pleasures of a visit to this part of the world is the chance to enjoy Tuscan food and wine in its “native environment”. 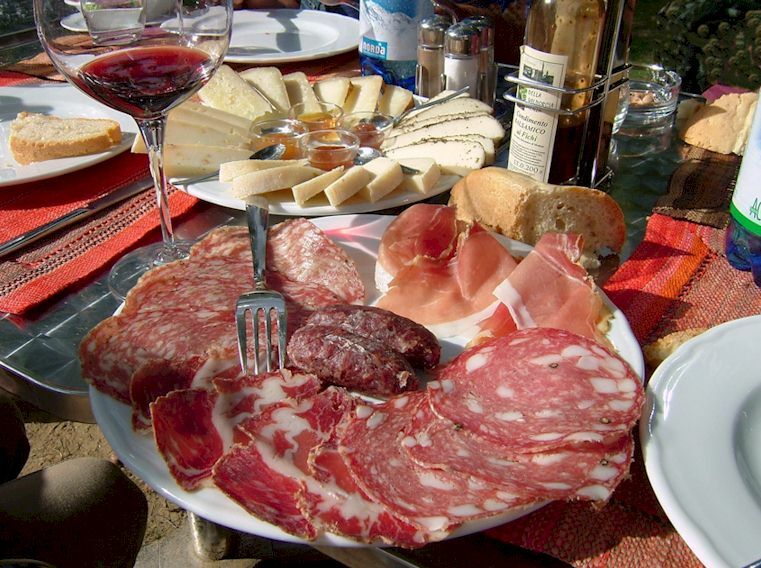 As everyone knows, a Tuscan meal is divided into several classical and invariant stages – antipasti, pasta, primo and secondo piatto, dolce. However, you do not need to order all of them! The normal human frame cannot handle a full scale Tuscan dinner more than once a month. Sharing plates at all stages is absolutely standard practice. This latter means that even a small group can enjoy a wide range of dishes at a single meal. Here are some more specialised topics which I hope will provide some ideas on how to enhance your oenogastronomic experience of Tuscany! Dining al fresco in Chianti.